Most of this project is based-upon the firmware from Mobilinkd but some discrete parts and some soldering (or breadboard) is required to get things working. By re-flashing an Arduino-compatible microcontroller, it’s possible to turn it into a KISS TNC for use with APRS/AX25. Depending upon where you get your ‘duino boards from, you can be ready to go on APRS for around £10 – see my product on Ham Goodies for pre-programmed solution. The outpout power is about 0,5W and that’s enough for most applications. 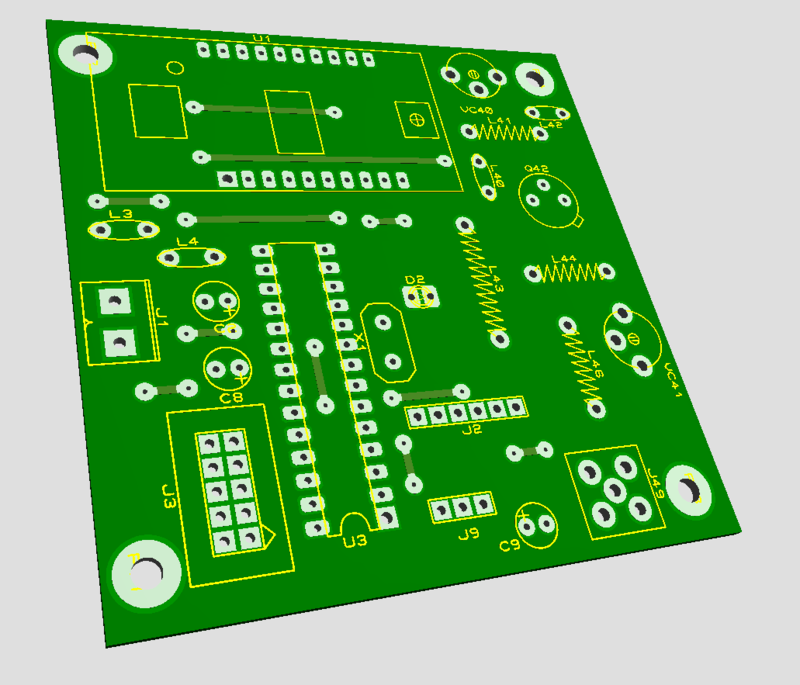 The mounting goal is to have a full APRS transmitter for a very low cost (25/30$). The ATMEGA328P is in fact an Arduino uno, and you need serial FTDI interface to program it. 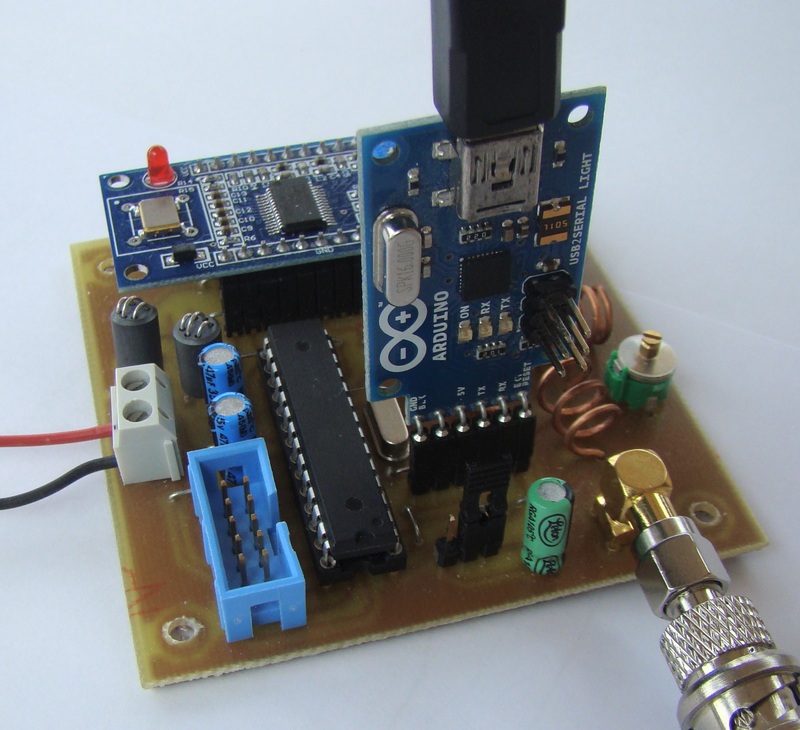 The Arduino program contains all software layers to generate FM AX25 like a classical tracker and transmitter separatly. Indeed, the microcontroller drive the dds to simulate FM modulation and generate 1200Hz and 2200hz signal as predict the ax25 protocol. Since the DDS is limited in higher frequency, it is necessary to add a multiplier for generating a VHF frequency. As you can see, the weather station, used here for measure temperature, can be recharged by a solar cell and thus dispense with external power. The scheme is organized around an ATMEGA328P, a DDS module (ad9850) and a PLL multiplier ISC511. 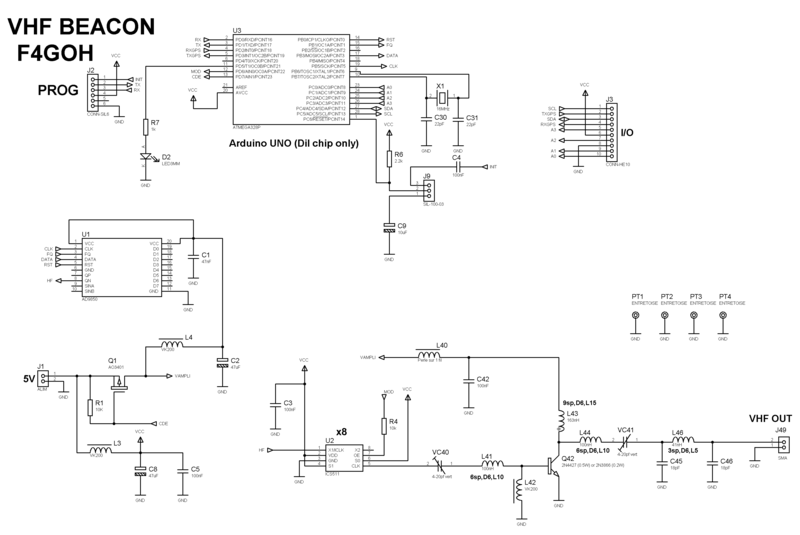 TTL output Qn DDS is perfect to control the ICS511. Indeed DDS SINA SINB filtered tensions are too low for the ICS511. The ICS511 is configured by 8 multiplier with to set the logic level 1 inputs S0 and S1. OE Output Enable command will allow the ATMEGA328P to easily generate modulation for fox hunting. FM modulation with the DDS9850 generates few harmonics , but it does not matter with a very QRP power. Power must be 5 V, the card does not have regulator because it can be powered by four 1.2V AA batteries. Note the P-channel MOSFET will turn off the DSS supply when there is no transmission, it will avoid consuming too much power if the system is powered by a battery. Consumption is reduced to 20mA. In reality ATMEGA328P contains a copy of an Arduino UNO bootloader. 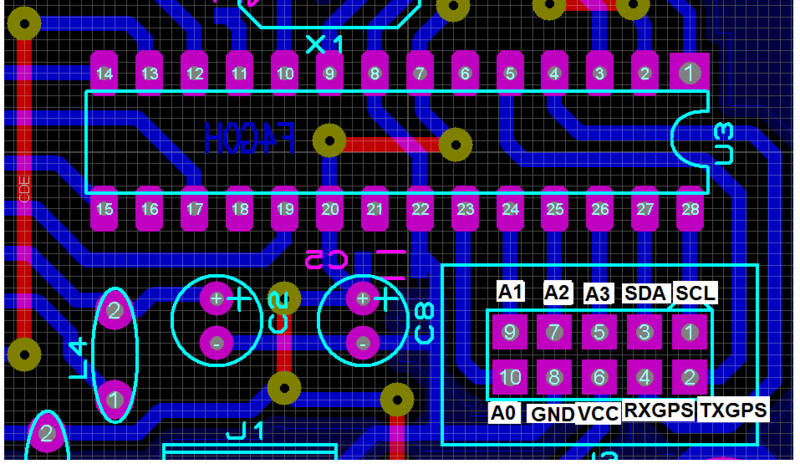 It will add a USB serial adapter card to program the microcontroller. The interface that connects to the J2 connector. (J9 jumper in position 2-3). J9 jumper in position 1-2 when no programmer connected to it to prevent inadvertent Reset. 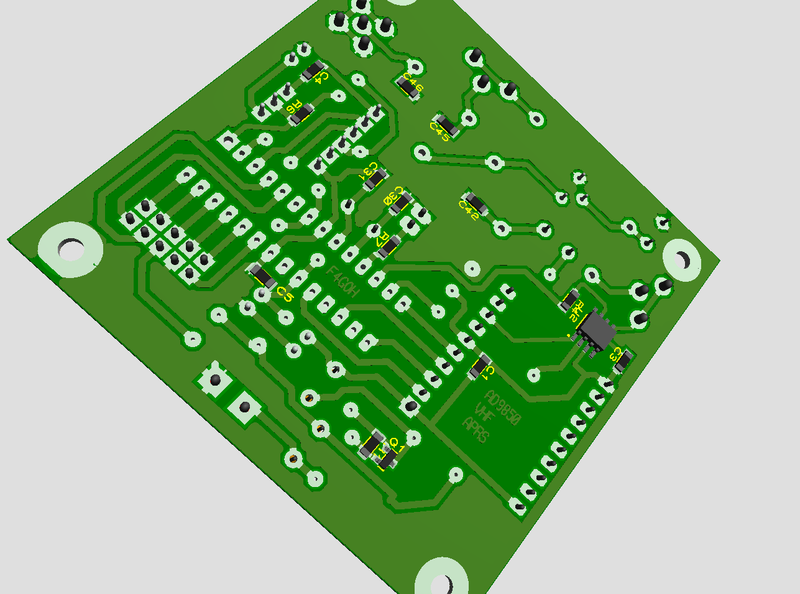 J3 connector, you will connect the GPS to pins 2 and 3, as well as analog inputs if the card is used in APRS weather station. If the LED is flashing, the GPS is connected properly and it was not until the FIX. If the LED is illuminated when the FIX GPS time is over and the frames will soon be transmitted. The assembly does not pose any particular problems, start by soldering SMD components, supports the Arduino and DDS except U2 (ICS511) and the 2N4427 transistor Q42. Make a copy of a Bootloader Arduino into a blank ATMEGA328P. After downloading the program, the D2 LED should blink. Insert the DDS on the electronic board. We must now install the libraries that control the DDS and AX25 protocol. Copy AD9850SPI VHFBEACON and directories in the libraries directory of arduino software. DDS the power LED should on. Now sold the ICS511. Viewing the signal on pin 5 of the ICS511. You must obtain a sinusoidal signal 144.800MHZ frequency. Finish by solder the 2N4427 transistor Q42. With a power meter trim capacitors in order to have a maximum output power. APRS frame is encoded simply and directly in a unsigned char array table track[ 72] . It will thus modify the various data fields according to your callsign and your location . A power-up is complete, the LED D2 will flash until the GPS FIX . APRS weather : weather.ino . Obviously, there is no weather sensors connected to the J3 connector. It is for you to make a software change according to your needs. ‘g’,’.’,’.’,’.’, //g = gust (peak wind speed in mph in the last 5 minutes). ‘t’,’.’,’.’,’.’, //t = temperature (in degrees Fahrenheit). ex 025, Temperatures below zero are expressed as -01 to -99. ‘r’,’.’,’.’,’.’, //r = rainfall (in hundredths of an inch) in the last hour. ‘p’,’.’,’.’,’.’, //p = rainfall (in hundredths of an inch) in the last 24 hours. ‘P’,’.’,’.’,’.’, //P = rainfall (in hundredths of an inch) since midnight. ‘h’,’.’,’.’, //h = humidity (in %. 00= 100%). For example, to change the temperature, you can inhale temp () function; and connect an NTC 10K on Analog input A0 of ATMEGA328P through the J3 connector. The principle adopted is virtually identical to the weather program, except that the frame is adapted to transmit telemetry. Of course, you can adapt your program according to your convenience. This program control Output Enable of the ICS51, That’s produces a « beep beep » to the desired frequency. This little digital transmitter , make you many services for APRS experiments at close range. The card is cheap to make and easy to integrate into a classic electric box . The Arduino software is modified depending on your applications. 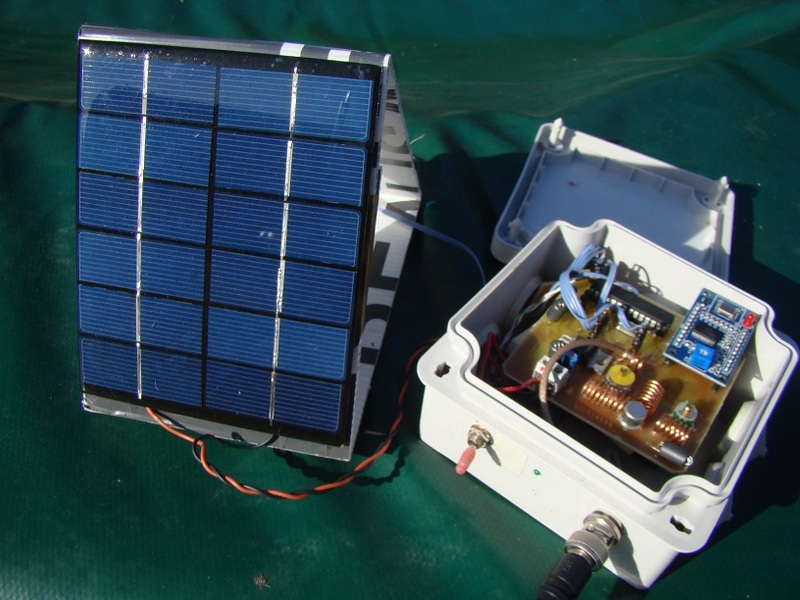 I installed a mini APRS station in my garden with a 6V solar cell without changing the batteries since 10 months. Thanks to F1LVT, who inspired me for the concept. Permit number request to display document (include file title). All credits and titles must remain a part of the original file or document. Each file is (C) and/or reg TM of the author. BUXCOMM, agents, or employees, are not responsible for errors or ommissions. Use of information contained in each file is at your own risk. Over the years I have built many antennas, Windom’s, Dipoles, Folded Dipoles, balanced terminated folded dipoles, BTFD or T2FD broadband antennas. I prefer to call the latter a “balanced, termination folded dipole (BTFD).” When tilted to a 30 degree incline, it is called a T2FD, or Tilted-Terminated-Folded-Dipole. It can be designed for any number of frequencies between 1.8 and 30 mHz. The original Tilted Terminated, folded dipole (T2FD) was the design of amateur radio operator (An Experimental All-Band Non-directional Transmitting Antenna” by Gil L. Countryman, W1RBK, (W3HH), QST, June 1949), the antenna was first used for maritime and naval communications. It was 1958 when I built a modified version of the T2FD. Instead of using the 800 ohm, non-inductive termination, I used an 450 Ώ Non-Inductive termination, and added the Guanella version of a transmission line transformer (TLT) 9:1 BALUN. Our balanced termination, folded dipole (BTFD) provided an excellent bandwidth using the tilted terminated, folded dipole (T2FD) designed for a low frequency with the upper frequency limit extending well above 50 megahertz. The articles I’ve read indicate the Tilted-Terminated-Folded-Dipole (T2FD) installed with the 30 degree incline, would exhibit an omni signal pattern.. This is not quite the situation, as I’ve found the direction of the slope is favored as the direction of the main lobe. Still the tilt or slope of 30 to 45 degrees is the recommended installation method. The balanced terminating resistance (BTR) becomes more critical as the feedpoint impedance is lowered. With lines of lower impedance the BTR value becomes more critical, to within about 25 ohms. Some builders who do not know or understand this, use a low value of 390 to 400 ohms, some as low as 200 ohms. They do so in order to use a more available BALUN and/or BTR. This too adds to the problem relating to the gain/bandwidth factor of this antenna. We recommend using a balanced termination resistor (BTR) greater than 500 ohms. To be on the safe side, use a 450 ohm BTR (BUXCOMM model 450TR), and a 9:1(BUXCOMM model B15C91) BALUN. To determine the dimensions of a BTFD or T2FD using 450 ohm termination and 9:1 BALUN use the following formulae to calculate the dimensions. Use 50.000 divided by F (frequency in Mhz). To make the calculations linear when computing dimensions for bands other than the bands used in the examples below. Length = 50.000 divided by 3.7, = 13.5 X 3.28 = 44.4 or approximately 44.5 ft.
50.000 divided by1.9 Mhz = 26.3 meters, multiplied by (meter conversion to feet) 3.28 = 86.3 feet. Spacing =(L feet x 0.2 = inches), thus 86.3 X .2 = 17 inches inches… Spacing is NOT critical, and can vary 4 inches either way. Thus you now have the dimensions you need to build a T2FD balanced termination folded dipole (BTFD). The tilted terminated folded dipole (T2FD) is an extremely broadband antenna, and it is a very quiet antenna indeed, as it is immune to terrestrial noise as compared with a vertical or a horizontal dipole. The SWR, Standing Wave Ratio, when transmitting may vary from an almost perfect match of 1.1:1 at some frequencies to 2.5:1 at other frequencies. In either case, either reading is good when you consider you are able to operate across the HF spectrum without an antenna tuner. Tilted, Terminated, Folded Dipole (T2FD) BUXCOMM model 1606T2FD, Low-Noise, High-Performance, T2FD Antenna. * Low-noise design, reduces sensitivity to terrestrial man-made noise and atmospheric static. * Constant sensitivity over the entire frequency range without an antenna tuner. * Coaxial cable between antenna and receiver. * Antenna is completely factory assembled and, ready to erect. * Heavy duty construction, both wire and fiberglass. 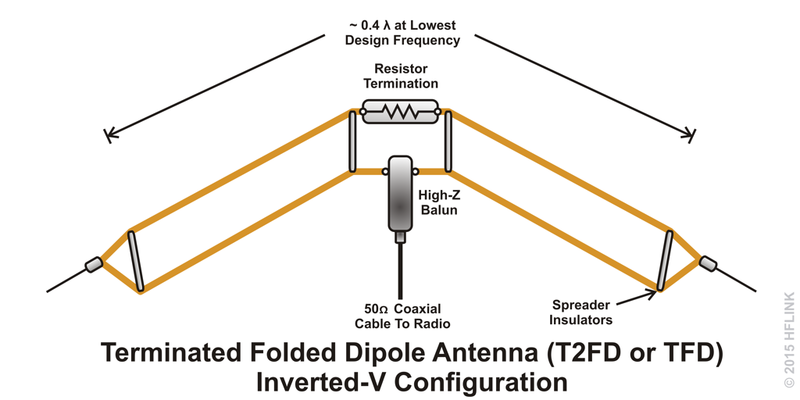 The balanced termination, folded dipole (BTFD) (Tilted Terminated Folded Dipole), originally developed by the US Navy, is an antenna still in common use by military and government receiving stations. There are good reasons for this choice by the professionals. The antenna has a balanced termination which provides it with its characteristic impedance. This terminated principle means the antenna is not prone to annoying man-made interference sources, such as fluorescent lights, dimmers, televisions etc. The antenna is also less subject to noise from likely causes, such as atmospheric static and open high-tension power lines. The balanced termination, folded dipole (BTFD) is really a “low-noise” transmitting and receiving antenna! By ensuring a constant impedance throughout the length of the antenna, the balanced termination, folded dipole (BTFD) is also less prone to distortion due to multi-path fading. Our tests have shown that when compared to dipole or long-wire antennas, the background noise with a balanced termination, folded dipole (BTFD) antenna is not only much lower, but allows weak signals normally not heard, to be audible and therefore legible. One of the most desirable features of the BTFD is when using digital modes, packet radio, PSK, SSTV, MT63, etc, makes for easy recovery of their signals. The immunity to terrestrial noise reduces the number of errors in data communications simply because of its low noise figure and lower distortion. The balanced termination, folded dipole (BTFD) does not suffer from dead spots across its frequency range as we have found the specifications for the BTFD are the same for its entire frequency range. This is not only a useful feature for shortwave listeners (SWL) who likes to listen to both the broadcast and other communications services of the shortwave spectrum. This is also ideal for the HAM who often and hastily change frequency’s. The ends of a dipole, trap-dipole, and long wire antennas have a high impedance. 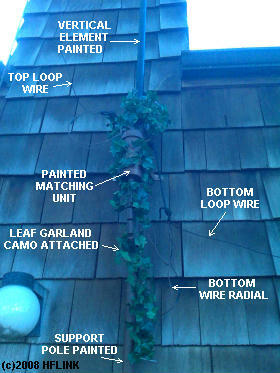 This is a problem when the wire runs in the vicinity of conductors such as metal roofs, trees, and similar vegetation. The balanced termination, folded dipole (BTFD) has fewer of these problems because of its constant impedance at any point of the antenna. In addition, the conductivity of the ground under the BTFD antenna has little influence on its performance. The height of the lower end of the balanced termination, folded dipole (BTFD) does not have to be more than 10 to 15 feet above the surface. 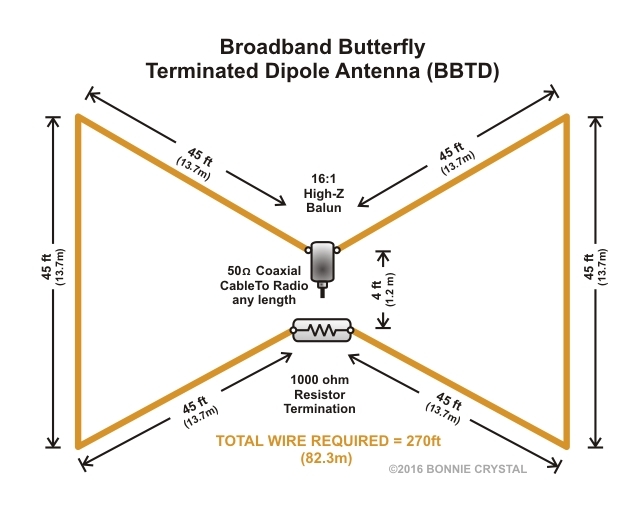 If you hang the balanced termination, folded dipole (BTFD) with an angle of 30 degrees, then the antenna pattern shows a number of lobes that it may cause you to feel the antenna is sensitive to signals from all directions, or omni-directional. This apparent “omni-directional” can be a bit misleading, however the circularity of the T2FD pattern does it over 300 degrees, but falls short of a full circle, signal capture. 2) Poor capture by the antenna in the E plane of the slope toward the low end. 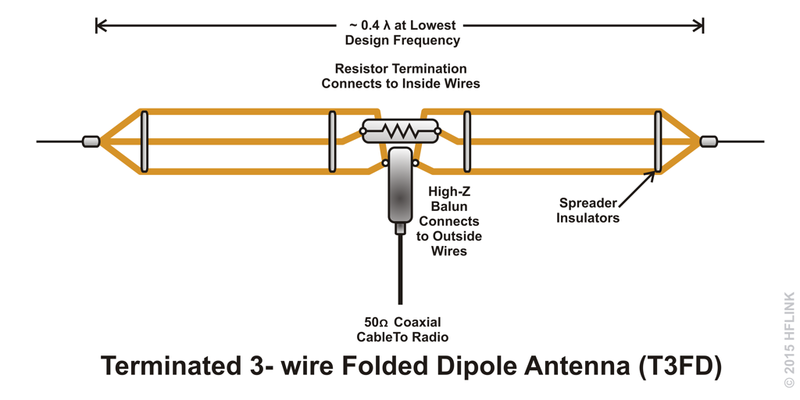 Figure 2: Properly installed, balanced termination, folded dipole (BTFD) is omni-directional over most of its operating range. resulting answer is length “A” to “B” (“L”) of the T2FD. As an example; we will use a frequency of 1.9 Mhz (center of the 160 meter-band) we divide 328 by 1.9 = 172, divided by 2 = 86 feet. To determine the spacing “D” 9/F = 4.7, to convert to inches, multiply 4.7, times 3.28 = 15.5 inches. Spacing “D” is not a critical dimension, and can vary +/- 4 inches, MOL. This 30 to 35 degree angle enables the antenna to be sensitive for horizontally polarized, as well as vertical polarized signals. This feature is where the T2FD exhibits one of its inherent properties; Reduced signal fading. For receiving purposes the balanced termination, folded dipole (BTFD) has an extra advantage. It is immune to man-made and low atmospheric (terrestrial) noise. On shortwave, this noise can be so high, that it decides the signal to noise ratio, in turn, the intelligibility of the received station. FIGURE 3: 16 inch spacing is not a critical dimension, and can vary +/- 2 inches MOL. FIGURE 4: Capture methods used to hold T2FD wire elements in place. BUXCOMM has experimented with the balanced termination, folded dipole (BTFD) for several years, continually improving on the design. By analyzing the problems from different angles, and trying various materials, the good points of the original design could be improved upon. The new design means that common coaxial cable can be used as a lead-in to the receiver, eliminating ingressed interference from equipment such as computers, power lines, and fluorescent lights. The BTR at the center of the antenna-wire at the balanced termination dissipates any static buildup during thunderstorms. This not only protects the sensitive input circuitry of the transceiver, it reduces the atmospheric noise which is generated as a result. 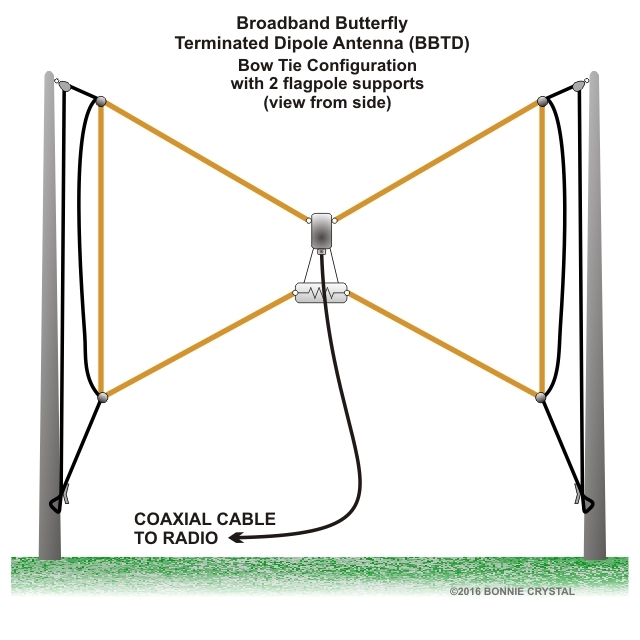 Construction: The BUXCOMM balanced termination, folded dipole (BTFD) is designed to withstand harse weather conditions and has survived wind’s with speeds over 150 mph. The higher impedances tend to balance the power in each leg more evenly. Us old timers have always used 800 ohm non-inductive balancing terminating resistors (BTR) for Rhombics, and 600 ohms for the terminated folded dipoles. However since 1965 I have found that better bandwidth and VSWR is obtained when using an 450 ohm termination resistor, and a 9:1 BALUN. I have written several books and articles about these antennas. In my writings I have demonstrated and illustrated the advantages of using the different impedances. After a lot of trial and error, design changes, Antenna analyzer/antenna bridges, and grid-dip meter testing, we found a happy medium! Therefore, my focus has been to make these antenna(s) as broad as possible, while maintaining a relative flat VSWR from 1.8 to 54 Mhz. The “happy medium” is to use a 9:1 BALUN and the BTR at, or near 450 ohms. Soil and environment may produce a variation in VSWR. To support the low frequencies, a BTR of 450 ohms with a BUXCOMM B15C91, 9 TO 1 BALUN provides a good match over wide HF frequency range from 1.8 to 30 Mhz while still minimizing TVI, and maintaining the antenna’s inherent immunity to terrestrial (man-made) noise. To optimize the T2FD for the best of all worlds, 1.8 to 55 Mhz, we use a 9 to 1 BALUN with an 450 ohm termination resistor. Something else we’ve found, that by installing the BTFD, tilted at 20 to 30 degrees, no more, no less. A single support pole, for the upper end will suffice. The BTFD will still exhibit an almost full circle, omni field of signal propagation. Another of the qualities and convenience of an antenna with a single feed line that can let you work over such a tremendous bandwidth is the feature for which the Balanced Terminated Folded Dipole is now so popular among professional users of the shortwave spectrum. The balanced termination, folded dipole (BTFD), or Tilted Terminated Folded Dipole (T2FD), is related to another well known antenna… the rhombic, known for its extraordinary performance and reproducibility of its radiation patterns. A balanced termination, folded dipole (BTFD) is “terminated” like the rhombic, a NON-INDUCTIVE RESISTOR is placed at the end of antenna, something which provides a LOAD or TERMINATION to the RF propagating along the antenna. But, the big differences between the balanced termination, folded dipole (BTFD) and the rhombic, are that the first is much smaller, has little or no directivity and fits into a rather small real-estate space, while a rhombic antenna may be several football field sizes, and transmits a narrow horizontal radiation pattern. 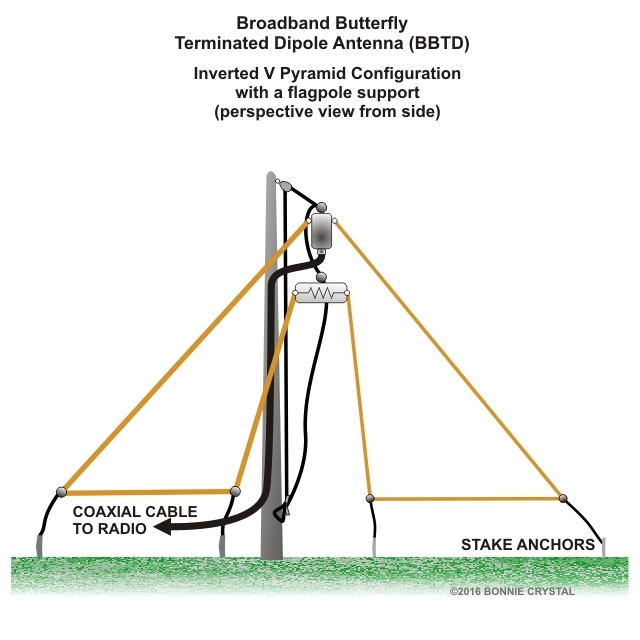 The balanced termination, folded dipole (BTFD) is a very practical broadband antenna. Building a balanced termination, folded dipole (BTFD) for the 1.8 to 30 Mhz frequency range requires taking into account some mechanical design considerations. For example, you can’t use a smaller wire size for the antenna, as its span is such, that number (AWG) 16, or AWG 14 can be used. In the late 1950s, we used bamboo or cured cane poles to make our wire spacers. In 1963, some of us decided to try more spacing, different (non-inductive) resistances, and finally settling on the design with optimum performance. Using a 450 ohm balanced termination resistor, a 9 to 1 BALUN and 1.4 ft (15-1/2 inch) spacers, a happy medium was within our grasps. Today, upper and lower wires of the balanced termination, folded dipole (BTFD) are kept at a uniform distance, we achieve this with fiber-glass spacers or spreaders. Over the years, when I’ve had available real-estate, the WINDOM is my favorite, however when antenna property space is limited, I’ve turned to the Balanced Termination Folded Dipole (BTFD or T2FD). The reason these two are my favorites, I don’t need an antenna tuner to cover the HF spectrum, and only one antenna meets all my HF operating requirements. This one HF antenna will enable you to forget that collection of rhombic’s, log-periodic, wideband dipoles and similar antenna arrays! Building your own balanced termination, folded dipole (BTFD/T2FD) will be like having a number of dipole antennas for many bands all in a single antenna and fed with only one cable. * Low-noise design, imune to man-made noise and atmospheric statics. * Use standard coaxial cable between antenna coupler and transceiver. * Antenna is complete, ready to connect your coax and erect. * Heavy duty construction in PVC covering, and SuperFlex wire. The BUXCOMM T2FD (Tilted Terminated Folded Dipole), was first developed for the US Navy. The BUXCOMM T2FD is in wide use by amateur and MARS operator’s. It has also been deployed by military, armed forces and embassy’s throughout the world. The antenna is terminated internally using a combination hybrid, balanced terminating resistor (BTR) to match the impedance of the feed-point to the 50 or 75 ohm coaxial feed-line. This terminated BTR principle allows the T2FD antenna to exhibit a high degree of immunity to terrestrial and bothersome man-made interference. The antenna is also less prone to noise from natural sources, such as static electricity. The BUXCOMM T2FD is truly a “low-noise” antenna. The BUXCOMM T2FD is a true “travelling-wave” antenna. This feature ensures a continuous impedance along the length of the antenna on both sides of the BUXCOMM integrated BALUN and BTR hybrid. The BUXCOMM T2FD is also less susceptible to other atmospheric interference caused by multipath fading. By installing the BUXCOMM T2FD at a 30 degree angle ensures the antenna will be receptive to horizontal, as well as vertically polarized signals. Installing the high end of the T2FD at 30 to 40 feet and let it tilt at a 25 to 35 degree angle to a low end height of 8 to 10 feet (approximately 3 metres), provides a signal capture that eliminates fading and enables both path (E and H plane), diversities. The antenna pattern displays many lobes, so many, that you can consider the antenna open to signals from all directions. The ends of a dipole, trap-dipole, and long-wire antennas have a high impedance. This is a problem when the wire runs in the vicinity of conductors such as metal, vegetation, and wires. The T2FD has less trouble because of its constant impedance at any point of the antenna. DO NOT INSTALL NEAR POWER LINES! Independent tests have shown that when compared to dipole or long-wire antennas, the background noise with a T2FD antenna is not only much lower, but weak (DX) signals can be easily recovered due to lower noise and reduced distortion. This can often make the difference between being able to hear a weak station or not. In the case of PSK, RTTY, Packet and similar digital mode reception, this lower distortion feature reduces the number of data loss and CRC errors. into the insulator wire-guide. The insulators shown below are for example only. The actual insulators supplied with BUXCOMM T2FD’s are large, heavy-duty, light-weight, Delrin (tmEI DuPont), UV resistant material. Dipoles, trap-dipoles, and similar antennas work well on one, or two bands in the HF spectrum but the BUXCOMM T2FD does not experience gaps in the HF and low VHF spectrum. The performance of the BUXCOMM T2FD maintains the same specs across the entire HF range. This is not only a useful feature for military communications stations that often change frequency on short notice, it is also excellent for the shortwave operator who wishes to monitor both broadcast, Amateur, MARS, and related clandestine stations within the HF spectrum. BUXCOMM T2FD is a very effective transmitting and receiving antenna. We use a ultra wide-band 450 ohm Non-Inductive BTR, and a wide-band BALUN that is paired and matched to the BTR at time of the BUXCOMM T2FD manufacture. By matching the BTR and BALUN, we have ensured maximum transfer of RF energy both transmitting and receiving. The development of our special frequency-compensated BALUN has so improved the BUXCOMM T2FD antenna to the point that it is a perfect match for the 50 Ohm coaxial feed-line. Some vendors find it difficult to effectively couple a 50 Ohm asymmetrical feeder onto the 450 Ohm symmetrical antenna input. They tried to solve this problem using an auto-transformer (a so-called “BALUN”). At BUXCOMM, we have designed an ultra wide-band (true) BALUN using a mix of ferrite cores that allow our T2FD to preserve its RF characteristics over the HF and low VHF frequency range. In addition, our BALUN make certain the BUXCOMM T2FD is grounded, so that static buildup that might occur, is discharged to earth. It also reduces the atmospheric noise which is generated at HF. The hybrid BTR/BALUN input (SO239) accepts coaxial cable that is terminated with a PL259 connector. The BUXCOMM T2FD antenna is shipped completely assembled and factory tested. The coaxial cable between the antenna and transceiver is not included because the length at each QTH is different. Where possible to use exact lengths, use 48 or 96 feet of 50 ohm coax feed-line. Balun is wired on a ring shape ferrite core with diameter 40/25 mmm hight 12 mm. This dimensions are big enough for 125watts CW, higher power can kill this balun (from autopsy, hi,hi: CW with 500watts fires it for sure – see photo). 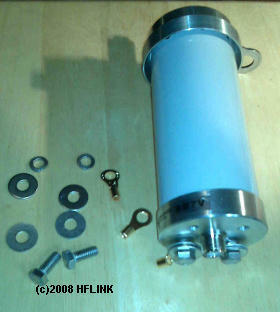 On the following photos you can see construction of this balun and assemble of 1250 Ohm resistor (8x10kOhms parallel). The Broadband VertaLoop Antenna was developed for use with Automatic Link Establishment to cover HF frequencies from 3.5MHz to 30MHz continuously with low SWR. The antenna presented here is a convenient combination of the Diamond BB7V vertical antenna (modified) and a large irregularly-shaped quad loop of wire, and a wire radial that is used to fine tune the antenna for best comprimise of low SWR on the various frequencies of operation. The objective was to provide improved performance over just a Diamond BB7V alone, or just a quad loop alone. On the higher HF frequencies, the vertical tends to provide good DX performance, while at the lower and middle HF frequencies the the loop provides higher efficiency. The Diamond BB7V is a transformer-matched vertical element antenna that normally uses the coaxial cable as the ground reference plane. In this configuration, both the coaxial cable and the support mast are part of the RF radiating element. This article is intended to show how the efficiency of a transformer-matched vertical may be increased, and to provide various design concepts and ideas for a range of broadband antenna types that can be built using the basic resistive-match method. The antenna described in this article may be seen as a prototype antenna, more as a basis for design and use by radio operators seeking to erect broadband antennas. Keep in mind that exact length of the wires, antenna height, and other aspects of this design may be changed to suit the user’s application and the environment that the antenna installation is being built for. The advantage of the use of a large loop of wire for this application is that the impedance at any given frequency is usually above 100 ohms. This works in concert with the impedance of the resistance in the matching unit to provide the desired low SWR at 50 ohms nominal impedance for use with standard coaxial cable and HF transceivers. 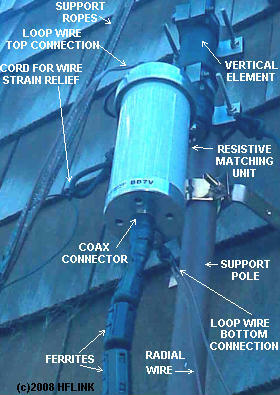 The installed Broadband VertaLoop Antenna, as built and documented here, provides SWR below 2:1 over 1.8MHz-30MHz range. 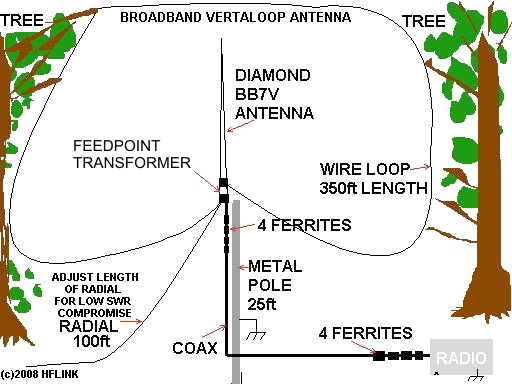 The antenna system appears to provide approximately +3dB to +20dB of estimated transmit and receive signal strength advantage (depending upon frequency) over the original Diamond BB7V vertical alone as intended by the manufacturer to be installed. This huge advantage has provided a significant improvement in on-the-air performance for this station’s ALE operations in the HF frequency range of 3 MHz -30MHz at the 100W to 200W transmitter power level. Photo above left: Broadband VertaLoop installed on a chimney. Photo above right: the feedpoint connections of the Broadband VertaLoop, including the ferrites, the strain relief cords for the wires, the matching unit, and other parts. 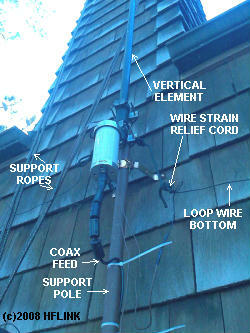 Photo above: Looking up at the antenna complete installation on a residential dwelling chimney, with vertical element, bottom loop wire, radial wire, and top loop wire. Photos above left and right: The Broadband VertaLoop being installed. 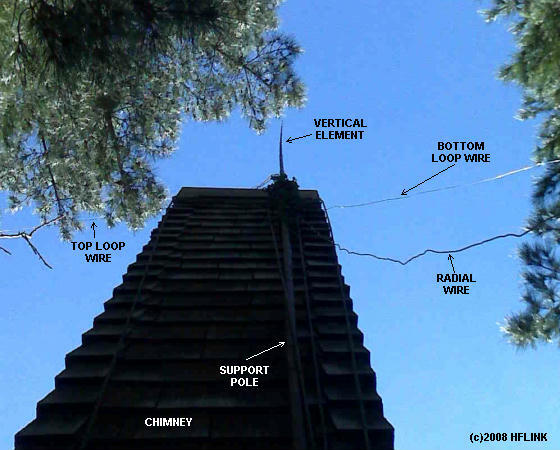 Testing at lower height, being prepared and tested for SWR, ready for final installation; including details of the camouflage, the feedpoint connections, and the wires, cords, and cables. The antenna element has been painted black and the support pole has been painted to match the color of the residential structure, in an effort to minimize the appearance of the antenna, and blend in with the surrounding vegetation. Modification of the Diamond BB7V transformer matching unit. Since the stock matching unit does not provide a connection to the shield of the coax for attachment of wires, it was necessary to add these connection points. The photo at left shows the tapped holes in the bottom part of the unit, with 5/16″-18 threads and “ground lug” bolts with washers. The modification includes tapping all of the 4 bottom ventilation holes of the unit, although only one of these connection points was used in this particular installation. These bolts are for the bottom connection of ground radials and loop wires. Extreme care must be observed when tapping the holes, not to cut into or disturb the internal parts of the matching unit. A small LED light can be placed at one of the holes to assist in viewing the internal parts while working on the modification. All of the bolts, nuts, and washers are stainless steel. The ring terminals for wire connections are plated or tinned copper or brass. It is important to avoid over-torque of the bolts, because the aluminum threads may be stripped if the bolts are tightened too much. Various versions of multi-wire dipole antennas are known and widely used. HF inverted-V antennas called “maypole” antennas, have been utilized with dipoles resonant in the amateur bands. The most common has been the 3.8MHz/7.1MHz resonant version fed with 50ohm coax. Technically, the antenna system consists of two or more dipoles of different lengths arranged radially in inverted-Vee form with a single common feedpoint. There are other configurations possible within the general category of “fan dipoles”. Autotuners have been in popular use for both amateur and non-amateur applications, especially when many channels or bands of frequencies are utilized throughout the HF spectrum. Problem frequenciesare sometimes found in long single-wire autotuner installations, usually due to combined RF reference plane (tuner ground) and wire resonance resulting in a very high impedance presented to the autotuner. At the problem frequencies, it can take a long time for the autotuner to repeatably find a match, or it may not be possible for it to find an acceptable match. Other problems with the same root cause can lead to excessive RF radiation from the feedline at the transmitter (hot mic syndrome). Sometimes, simply changing the length of the antenna wire slightly is sufficient to move the “problem” to an unused frequency. But changes in the ground conductivity due to rain or other factors can bring the problem back. HF-ALE (Automatic Link Establishment) requires fast autotuner action, and the linking functions best when the antenna matching autotuning cycle is completed within a fraction of a second. 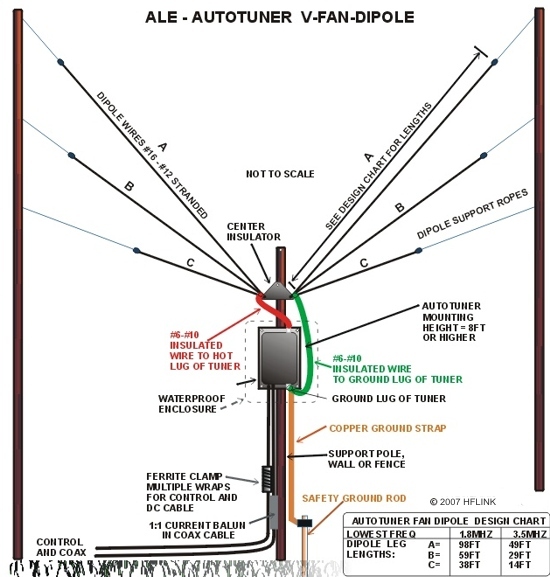 Application of the multi-wire dipole principle to the autotuner installation provides a solution. In practice, it has been found that there are advantages to certain wire lengths or wire length ratios for autotuner use in the HF spectrum. These ratios of wire lengths present multiple “convenient” lower impedances to the autotuner at any given frequency, enabling it to achieve a matched condition rapidly and repeatably, thereby mitigating “problem frequencies”. I have developed the two successful versions of an autotuner fan dipole antenna system shown above, through both theoretical and empirical design (trial and error). I am presently using one of these antenna systems on the air 24/7 for ALE, from 1.8MHz to 28MHz. I am using an SG-230 autotuner in this installation, but the principles are the same for most of the common autotuners of similar type. I’ve set up 3 different SGC autotuner systems at base stations using the common mode chokes (1:1 balun a misnomer) in the control/DC cables/feedlines, combined with a grounding strap to earth. These techniques keep some of the noise from computers and equipment in the station from being conducted into the autotuner’s antenna system on receive, and they help choke off RF currents on transmit from going down the cables into the station. In the first two of those installations, severe RFI was eliminated that was present before the “chokes” were installed. In the third, I installed the chokes during the initial installation, and have not removed them to see how much difference they make. Indeed, many operators are content to simply ground the coax and control cable at the station entrance (good practice). I’m from ye olde school of lightning protection (having built broadcast stations and telephone central switching offices in my earlier career), so you will see additional ground straps present near the antenna in my base station antenna designs. I believe that a direct lightning discharge path to earth ground is a good design starting point for basic lightning protection. I also believe that the possible loss in RF efficiency at some frequencies is worth trading for the added safety that earth grounding at the antenna provides. For temporary portable installations when no chance of lightning hazard exists, the safety ground strap could be eliminated. The common mode chokes and control feedline ferrites may also be eliminated if no “hot mic” RF feedback or RFI is experienced. There are other possible combinations of wire lengths and configurations that should function in a similar manner. I am interested in the results of others who are using this type of antenna system or derivatives of it. Feedback or field reports may be sent directly to the HFLINK or HFpack groups. Operators have expressed interest in using a wide variety of antenna autotuners for ALE. Many autotuners do not have ALE capability, which requires tuning element bypass switching inside the autotuner. Some types of autotuners are intended for use with antennas fed by coaxial cable. LDG is an example. With these autotuners, a suitable antenna must be used that provides a somewhat lower SWR on the bands of interest. 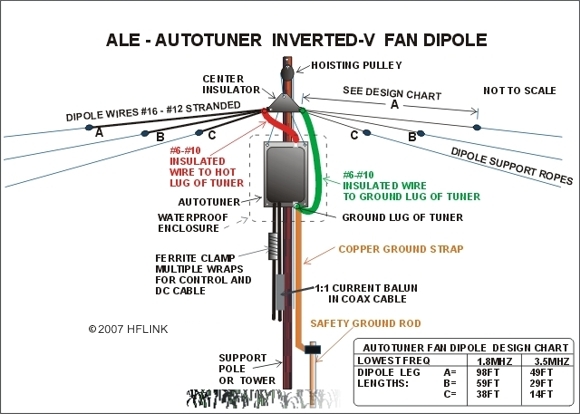 An offset feedpoint dipole with a 4:1 balun or a coaxial fed fan dipole can provide a good enough match for coaxial autotuners to operate properly and provide the instantaneous tuning required for ALE operation. Some manufacturers have ALE bypass switching in their autotuners, such as SGC or Icom, but the internal timing may not be adequate for good ALE operation or SSB voice. 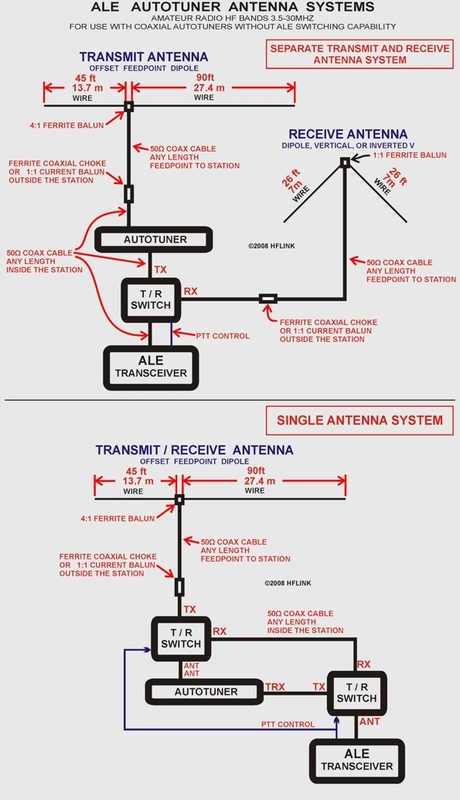 To solve all these problems, I’ve designed and used the autotuner antenna system shown in the diagram, with an external T/R switch, and a separate receive antenna. The basic set up is to enable the autotuner to operate only for transmit, into a good transmit antenna… then, use a separate antenna that does not require tuning, only on receive. This ALE Autotuner Antenna System is for use with all autotuners that do not have internal ALE bypass switching capability… such as SGC, LDG, Icom, Yaesu, etc. It is also possible to use a single antenna, with 2 T/R switches. Both of these systems are shown in the above diagram. A suitable coaxial T/R switch may be built homebrew or purchased complete. There are several different types of coaxial switches available on the market. Some transceivers have built-in receive antenna switching, and this can be used without the need for an external T/R switch. I have used the MFJ-1026 for this purpose for many years, and therefore I can recommend it. Although I have not used the MFJ-1708, it is probably a more economical solution. For adequate ALE timing, it is recommended that the PTT switching output line of the transceiver is used to drive the T/R switch, rather than RF sensing. PTT transmit switching output is available at the accessory connector of most transceivers, commonly used to key the T/R of linear amplifiers. multiband operation, and their effectiveness is dubious for other applications. The receive antenna may be almost any type of antenna that provides low noise. I prefer an inverted V antenna cut for 10MHz. I have also used a vertical whip antenna, and a random wire antenna. Keep in mind that a ferrite coaxial choke should be used both at the feedpoint and on the coax cable just before it enters the building. This prevents local noise from power line, computer, monitor, TV sets, and lighting from being conducted into the antenna from the building. 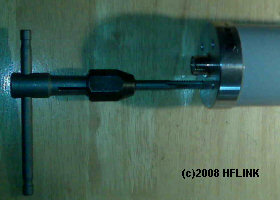 On the receive or transmit antenna, for the ferrite coaxial choke at the building, ferrite clamps can be used, but be sure to use at least 8 clamps in series. most may only need a T/R switch and some coax jumpers to set it up. 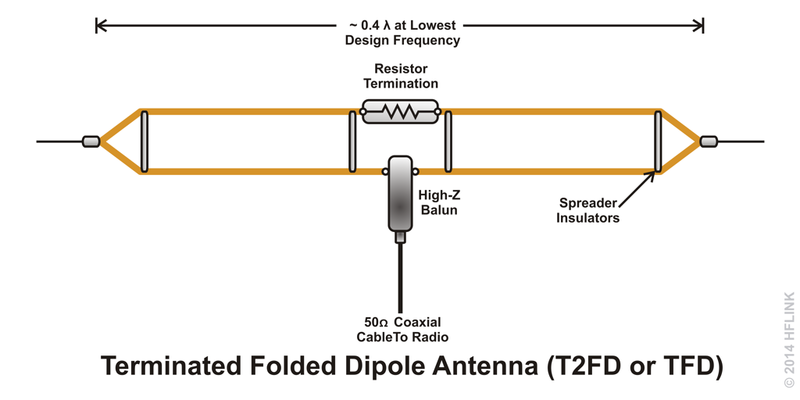 The Terminated Folded Dipole, TFD or T2FD, is one of the most popular antennas for ALE Automatic Link Establishment. It performs well on the air, provides good SWR throughout the entire HF range, and does not require an autotuner or coupler. There are many commercial versions and homebrew flavors of the TFD.This article attempts to cover some of the historic background and evolution of this broadband antenna. TFD or T2FD is a term of initialism* that encompasses a classification group of antenna design. Terminated Folded Dipole is a folded dipole in which a resistive and/or reactive termination is inserted in the middle of the exposed loop of the active metallic dipole element circuit, opposite the feedpoint. The terminology and initialism has evolved over the past half-century, as variations in design have sprung forth, combined with the deep affinity among engineers and radio operators for descriptive jargon. The TFD or T2FD antenna is also known as a Squashed Rhombic and it is part of a more general category of Broadband Dipoles. *Note: Definition of initialism / in·i·tial·ism / iˈniSHəˌlizəm / noun: An abbreviation consisting of initial letters pronounced separately (e.g., CPU). Acronyms are abbreviations that are blended into pronunciation with syllables as if they were words (e.g., NASA or LASER). Prior to 1949, the term TFD or TTFD originally stood for Tilted Folded Dipole, Terminated Folded Dipole, Terminated Tilted Folded Dipole, or Tilted Terminated Folded Dipole. see 1949 article snippet below By 1950 or 1951 it was widely known in commercial, military, and amateur radio. The TTFD term was converted to T²FD (T-squared FD) and then T2FD with keyboards lacking superscript (the superscript 2became a numerical figure 2). Insertion of other higher numerical integers (example: T3FD for a Terminated 3-wire Folded Dipole) into the initialism evolved much later, circa 1985 to 1990, as a shorthand for the number of half-wave elements connected in the active circuit of the dipole. Multi-wire TFDs became popular as they were found to have reduced termination losses, wider bandwidth, and higher radiation efficiency. T3FD, T4FD, etc. To Tilt or Not to Tilt? The recommended tilt or sloping dipole configuration in the T2FD original design articles purportedly achieved a particular beneficial radiation directional pattern for the application or location in which the antenna was developed, and this was widely carried over by other early experimenters. The tilt was later found to be completely superfluous to basic TFD design and performance. The essence of the TFD antenna electrical structure can be applied to most all of the various orientation configurations of normal dipoles. It has a radiation pattern identical to a normal dipole of similar size. Tilt or slope is not necessary to the performance of the TFD. Tilt was found to be undesirable for NVIS and omnidirectional applications. Design requirements calling for tilt configuration or sloped installations are less common in modern installations, while the more popular Inverted-V or flat-top formats tend to be favored. Yet the Tilt still lives on in antenna mythology and superstition. Some have joked that the Tilt made it a more complex acronym while imbuing black magic… therefore adding perceived value. At this point, most will agree that the TFD reputation benefits from such perceived value mystique, while simultaneously acknowledging that it continues to have many detractors. Below, some of the original articles show how the early T2FD was introduced and started to gain popularity. 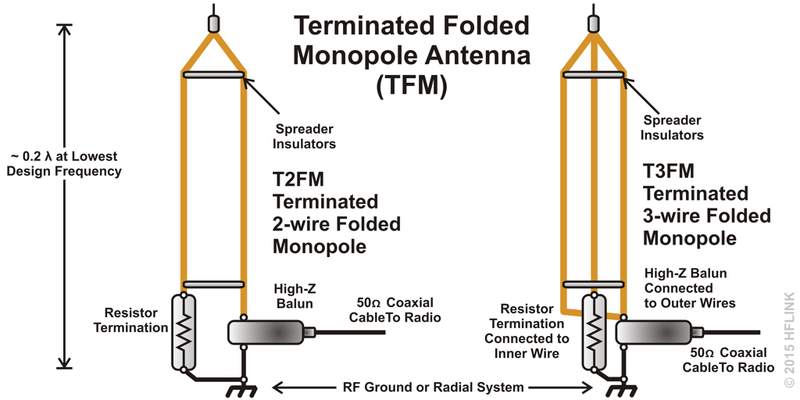 The Terminated Folded Monopole (TFM) is a derivation of the TFD, and it is usually implemented as a vertical antenna over an RF ground plane or a radial system. 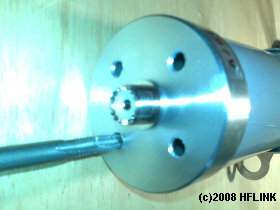 Like the TFD, the TFM can be designed as a multi-wire or cage antenna. T2FM, T3FM, T4FM, T5FM, etc. The TFM has the same broadband qualities as the TFD, but offers a lower footprint configuration and more omnidirectional pattern for different applications. The following diagram shows a typical BTSL Antenna configuration, SWR curve, and radiation patterns. The length and impedance is optimized for low SWR in the Amateur Radio HF bands. It is a horizontal loop, constructed of wire. The terminating resistance is 450 ohms, and the balun may be either 9:1 or 12:1 impedance ratio. The SWR in the 4MHz to 6MHz range is better with the 12:1 balun. 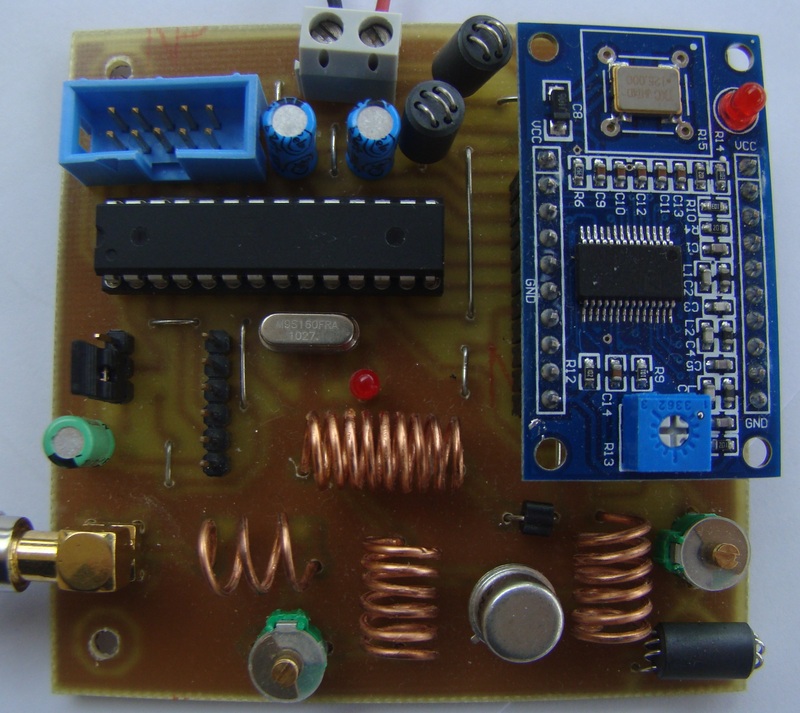 It is made with the same components commonly found with T2FD or T3FD antennas. The main difference between the T2FD and the BTSL is: the BTSL has superior NVIS performance. However, at lower radiation angles (below 45 degrees) on 7MHz to 30MHz, it breaks into directive beam lobes, mostly favoring the general direction of the resistor termination. This can be either an advantage or undesirable, depending on the user’s application and location. Radiation efficiency gain approximately +2dB better than a T2FD. Less visibly obtrusive and more stealthy than a T2FD. Good NVIS high angle regional performance below 14MHz. Good DX performance at 14MHz and above. Lower frequency rolloff knee than T2FD of same length. Smooth and well-matched SWR curve. The first prototype, as shown in the above drawing, was built in 2016 to fit within a horizontal area constraint of 100 feet between 2 supports. The prototype is built as if looking at it from the side in the drawing, with the appearance of a bow tie. It had an SWR design goal of less than 2:1 from 1.8 MHz to 60 MHz. The measured SWR of the prototype is about 1.5:1. It covers 80 meters through 10 meters continuously with no gaps. The prototype utilized a 16:1 balun and an 800 ohm non-inductive resistor termination, but a 1000 ohm resistor is recommended for best SWR over the entire HF range. The resistor should be rated at about half the transmitter power for operation above 3.5 MHz. If utilized below 3.5 MHz, then the resistor should be rated at the full transmitter power. Fed with 50 ohm coax, a tuner is not needed. 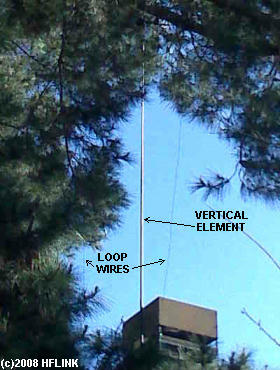 The above image shows a side view of a BBTD antenna in the bow tie configuration with 2 flagpole type supports. A simple arrangement of insulated rope or cord provides the taut structural shape of the antenna. The center balun is supported by the upper wires of the antenna, and the resistor termination is suspended below the balun by insulated rope or cord. Stealthy construction using trees is possible with this configuration. 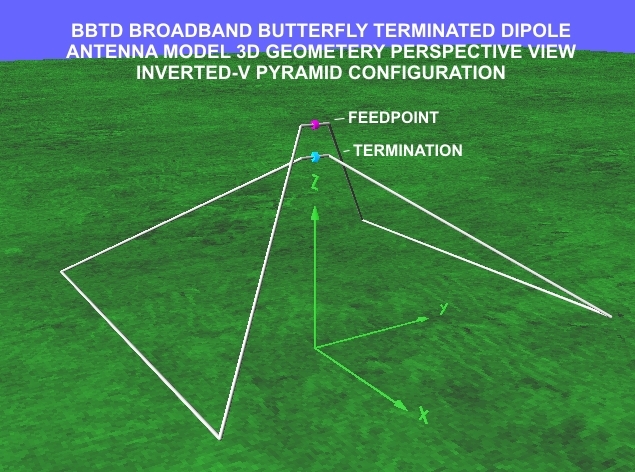 The bow tie configuration prototype BBTD with dimensions shown above has a low frequency efficiency knee drop off around 3.5 MHz. With a gain of about -16dB on 160 meters, it is very inefficient. But the SWR is good 🙂 On 160 meters SSB with 100 Watts at night, it can still be expected to work stations out to a radius of about 300 miles. One suggested method to get better performance below 2 MHz is to disconnect the termination resistor with a relay, then use an antenna tuner at the radio. 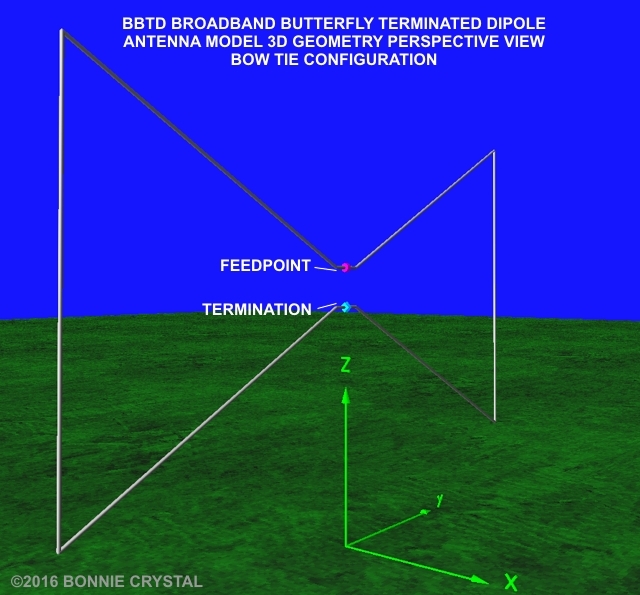 Antenna models show that the BBTD bow tie configuration is omni-directional at 14 MHz and below. See the radiation pattern plot image below. At frequencies of 18 MHz and higher, it shows a vague omni X pattern. It is more omni-directional than a dipole of similar size and position. The Inverted-V or other horizontal configurations are expected to exhibit similar patterns. 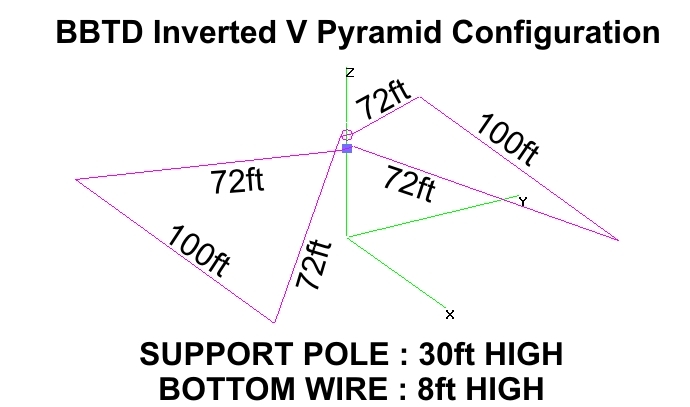 The image below shows a side perspective view of a BBTD antenna in the inverted V configuration with a single flagpole type support. The bottom sides of the triangular wire elements should be deployed as far above ground as possible, and staked out to anchors with insulated rope or cord. Stealthy or temporary construction using a tree is also possible with this configuration. The model shows a good SWR, below 2:1 over the entire MF-HF range from 1.5MHz to 30MHz. The model shows a gain of about +5dBi above 13MHz, and good performance on lower frequencies. The efficiency drops off at around 3.5 MHz, where the gain is about -3dBi. The model shows that the radiation pattern is substantially omnidirectional at 10MHz and below. At 14MHz and above, it has a broad X or lumpy square pattern, slightly favoring the direction of the horizontal wires. 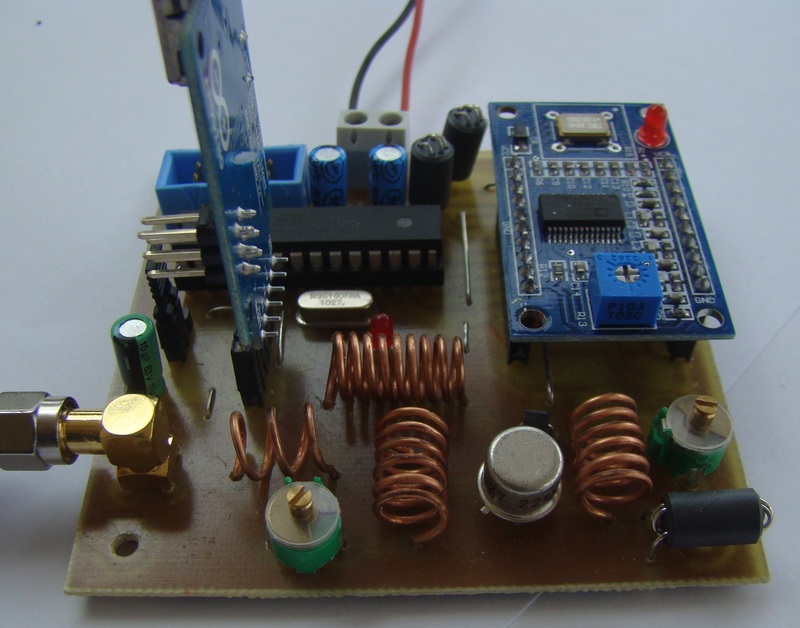 Learn how to build a FM Radio Transmitter using a Raspberry Pi. This little hack doesn’t need anything much other than the Raspberry Pi and a Jumper cable. It allows you to transmit any audio content through the Raspberry Pi. Building this Raspberry Pi Radio Transmitter wouldn’t take more than 15-20 minutes to set up and start transmitting. Connect a jumper cable to header 7 of the Raspberry Pi, the jumper cable acts as the transmitter for Radio. If everything went well you should now be hearing Star Wars sound track in your radio. In the next post we will learn how to make a playlist for the Raspberry Pi Radio Transmitter. Although if you’re feeling like exploring check out the PirateRadio project which enables playback without using command line. Note : The Raspberry Pi radio transmitter can be built without the jumper cable, the trade-off is that the range drops to ~10 cm from 100 meters.It is not allowed to broadcast on these frequencies in some countries. Make sure you read about your local laws before trying this hack.